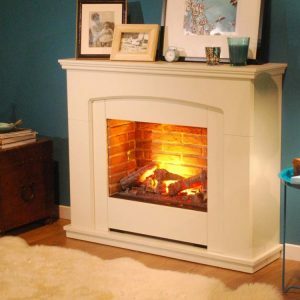 Home » What is an Electric Fire Place? Simply put, an electric fireplace is a fancy looking heater. At least it acts like a heater, but it fits into the decor in a much nicer way. The electric fire comes with a lot of flexibility. Meaning that it can be used in many different places in the home without the risk that standard fireplaces create. A good quality electric fireplace will mimic fire burning logs. However, there is no flame affiliated with this type of fireplace. They work off of electricity. In many cases, they are designed to use light bulbs which produce the lighting under the artificial logs. Creating the look of flames. The invention of the electric fireplace is not something that is new. It dates back to 1912. But, they were not all that popular until around the 1950s. During that time, the technology built into them became more realistic. There is no doubt that there was a demand for this type of fireplace. Many of the homes in the UK did not want to have to rely on traditional fireplaces. Some did not have the ability to utilize the gas forms of fireplaces that are available. Another great ability one has with the electric fire is that someone can take it with them if they move. There is no intensive installation for this type of product. Some do come with a fan built-in that will disburse heat from a built-in heater. This gives them much more realism. Some individuals don’t even realize that they are looking at an electric fireplace. The cost factor that comes with the electric fireplace is a cost for the electricity itself. Most find that this is not nearly as expensive as what it is to buy wood for traditional fireplaces. There may be a few disadvantages, but they are minimal.